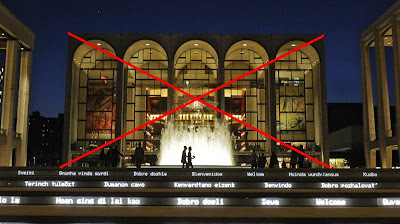 A Liberal's Libretto: Peter Gelb to OPERA NEWS: critiques are not "in the best interests of the Met" - so, STOP IT. 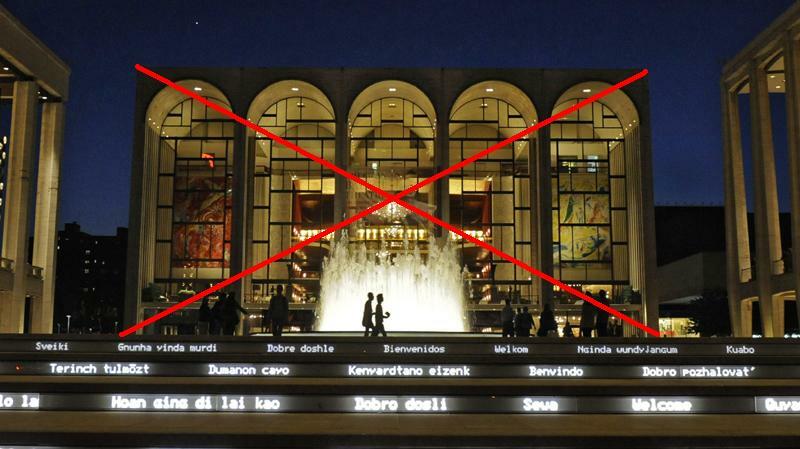 Peter Gelb to OPERA NEWS: critiques are not "in the best interests of the Met" - so, STOP IT. 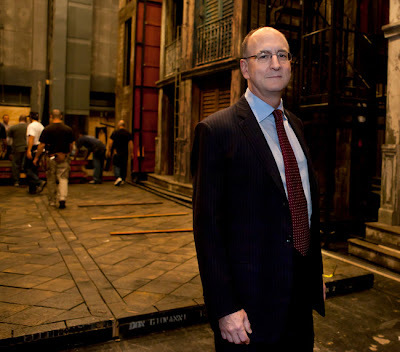 The long arms of the Metropolitan Opera's sovereign general manager, Peter Gelb, have - again - slapped down a media source. As you'll remember, the first slap from Gelb came in August of last year when Gelb's Met forced the shut down of the Met Futures blog that, since 1996, aggregated information (some gossip, some true) regarding potential upcoming casting-slash-season decisions from the Met. But, as a parting gift, the Met’s communications department offered him some CDs, which he accepted, and of course carefully spoke with him about the tone and content of his farewell post. Last month, yet another slap from Peter Gelb came in the form of complaining to the leadership at WQXR about a blog post that called his leadership abilities into question. 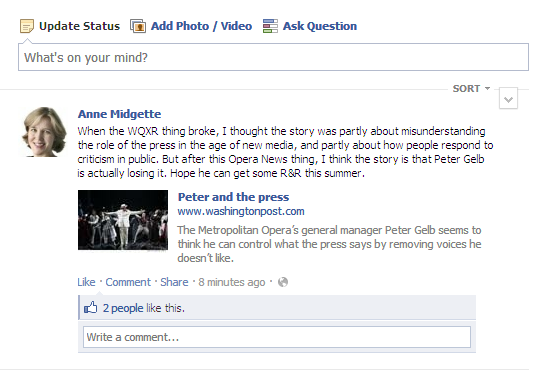 The powers-that-be at WQXR made sure the blog post was pulled. And this time, it's OPERA NEWS Magazine. Since I have been corrected on this subject previously, it is important for me to clearly state that OPERA NEWS - with it's circulation of 100,000 providing information on the Met's casts, broadcasts and glossy profiles of its star singers - is a publication of the Metropolitan Opera Guild, NOT the Metropolitan Opera. The Metropolitan Opera Guild is a guild formed for sake of fundraising for the Metropolitan Opera. As was pointed out to me - it is, in point of fact, a separate not-for-profit entity. In addition to being a unabashed advertising and public relations vehicle for the Met, OPERA NEWS runs features on other opera houses, seasonal festivals and (a personal favorite of Yours Truly) performers of past eras. The In Review section of the publication runs critiques of performances from around the world by reviewers who are, on the whole, relatively respected and reasonably astute. Here's the rub, though ... OPERA NEWS, the 76 year old, leading classical music magazines said on Monday that it would stop reviewing the Metropolitan Opera's productions - effective as of the June 2012 issue. While it is said that the decision was made by the magazine, it is understood by many to be a policy prompted by the dissatisfaction on the part of Gelb the Met over negative critiques. The move came after a review in April took aim at the Met’s new production of Wagner’s “Ring” cycle — a hallmark of Mr. Gelb’s tenure that has led to a firestorm — and after a top Opera News editor criticized the Met’s direction in a scathing essay in the May issue. Mr. Gelb said in an interview on Monday that the decision was made “in collaboration with the guild” but that he never liked the idea that an organization created to support the Met had a publication passing judgment on its productions. Worse yet, he said, is a publication that “continuously rips into” an institution that its parent is supposed to help. SO, in other words, all was well while OPERA NEWS gave it's usual sugary-sweet reviews of the Met's productions ... but, as soon as the magazine which is published by a separate not-for-profit entity became critical, they get a smack-down. Opera News has reviewed Met productions continuously since at least the mid-1970s, [F. Paul Driscoll, the magazine’s editor in chief] said. While not frequent, negative notices have periodically made their way in, to the discomfiture of previous Met administrations. But no ban was imposed, at least in recent decades. In the April issue, a review by Fred Cohn criticized the staging of Götterdämmerung, the final work in the “Ring” cycle. The productions of the four operas, which finished their run this month and were directed by Robert Lepage, were the subject of much critical scorn, although they had many fans too. Mr. Lepage’s huge piece of machinery used for all the operas functioned as a lightning rod. “The physical scale of Robert Lepage’s Götterdämmerung may have been immense, but its ambitions seemed puny,” Mr. Cohn wrote. Mr. Gelb singled out the line in Monday’s interview. Such negative comments from a publication that is part of a Met support organization “certainly would not be in the best interests of the Met,” he said. OH! I get it ... OPERA NEWS is now *only* to be an advertising and public relations vehicle from an in-house fundraising organization - NOT an outlet of independent journalism (not that it was really all-that-independent to begin with). Clearly, OPERA NEWS is supposed to continue with it's glossy spreads on the Met's casts, broadcasts and star singers, while keeping the Met beyond reproach and being critical of everyone else. Did Gelb not stop to think that some criticism of the Met, and his leadership, worked well as an occasional counterbalance to the pages upon pages of blatant advertising? By eschewing work at the Met but continuing to publish reviews of other houses, the magazine and the Metropolitan Opera generally have cast a pall over their credibility if not their ethics.